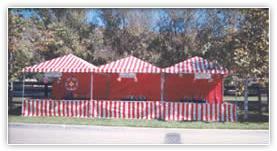 Our colorful game booths house many of the popular games you see in the traveling carnival. Pitch the Coin, Cork Gun Shooting Galley, Tip the Cat, Ring-O-Prize, Milk Can Toss, Six Ball Roll, and Dart Balloons, just to name a few. Your guests play the games to win prizes. Call us at (323) 256-9613 for a complete list of available games!